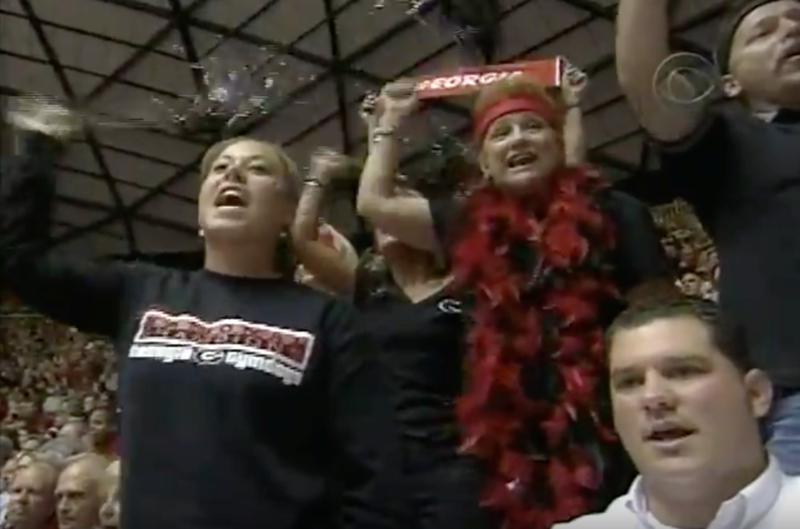 It’s time for the 2000s, part two! If you missed it, check out part one, and don’t miss any of our throwback Thursday summer coverage. Let’s jump in! 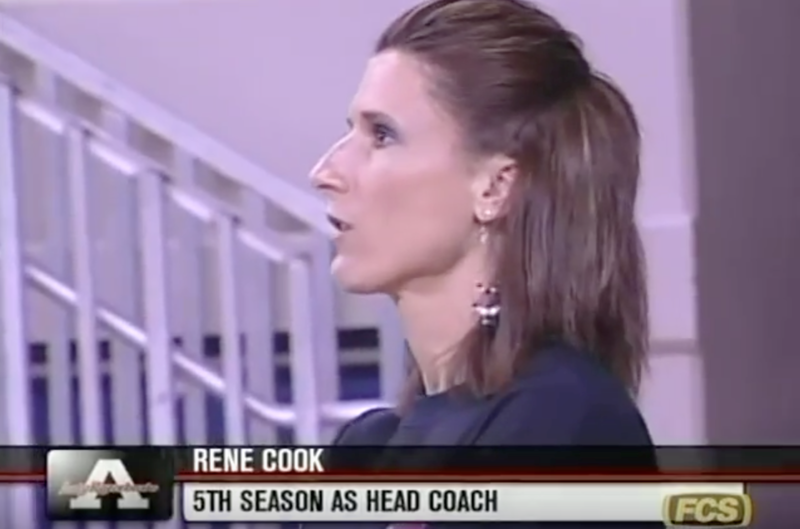 We kick off the second half of the 2000s with a classic look: oversized suit jackets and, more importantly, shoulder pads. 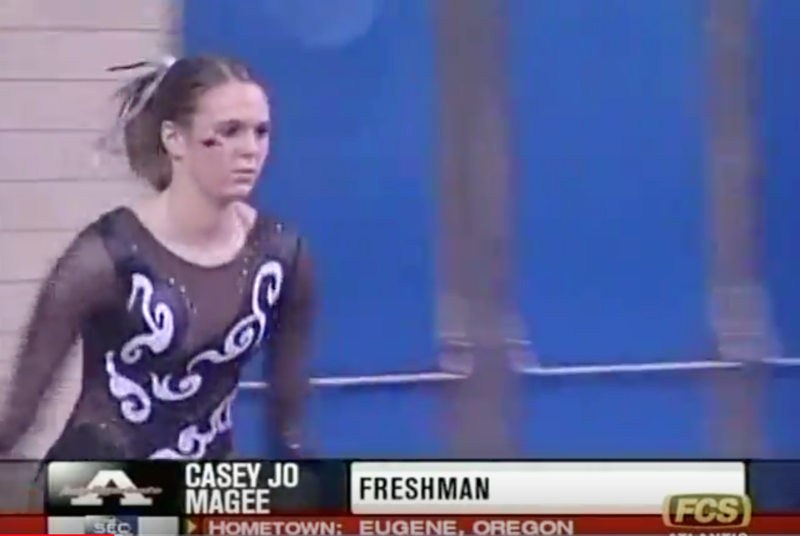 Umm, Oregon State, we love this? Use metallic orange more, please! We’re giggling at this framing. 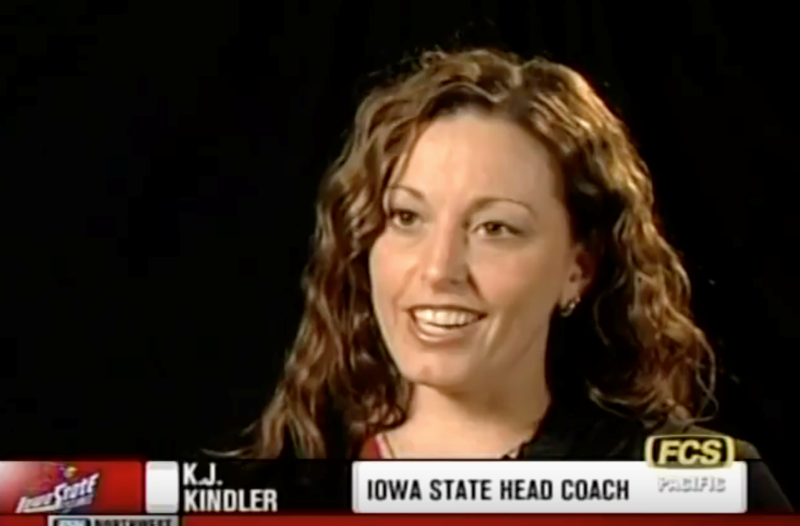 KJ with the crimped hair. 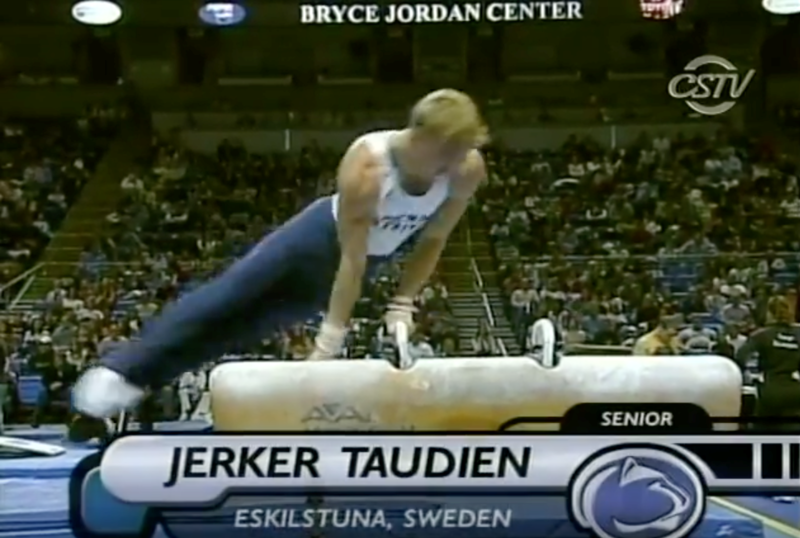 Casual head stand on the beam. Washington with the sleeveless leo and a giant husky on the front. 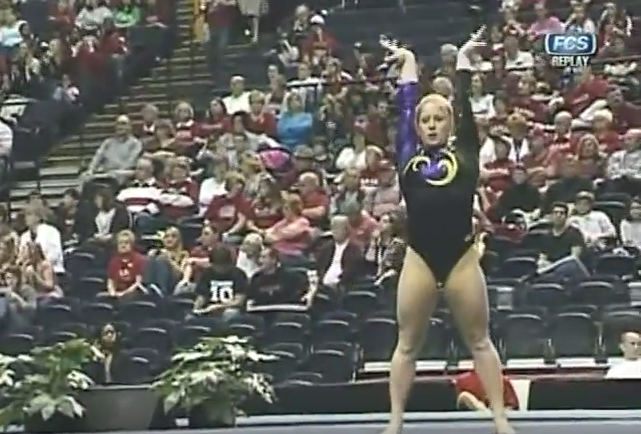 Velvet sleeves + mystique body = so ‘00s. 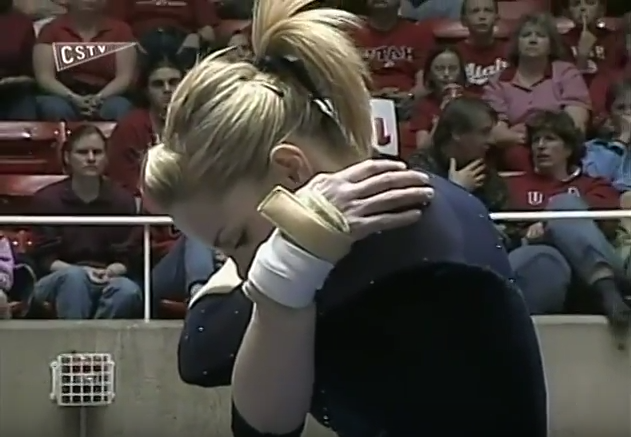 The birth of the college salute? Back when the worm was still a real thing people did. Also, KJ choreo. We’re not in 2004 anymore, Toto. 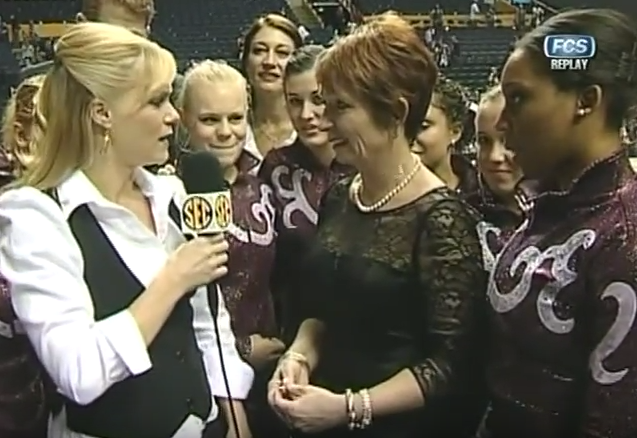 Everything about this image is perfect—from the “artsy” effects to the high-neck leo. Since when was the obvious choice for abbreviating George Washington “Geo. Washington”? Baggy, swishy, cinched pant legs. 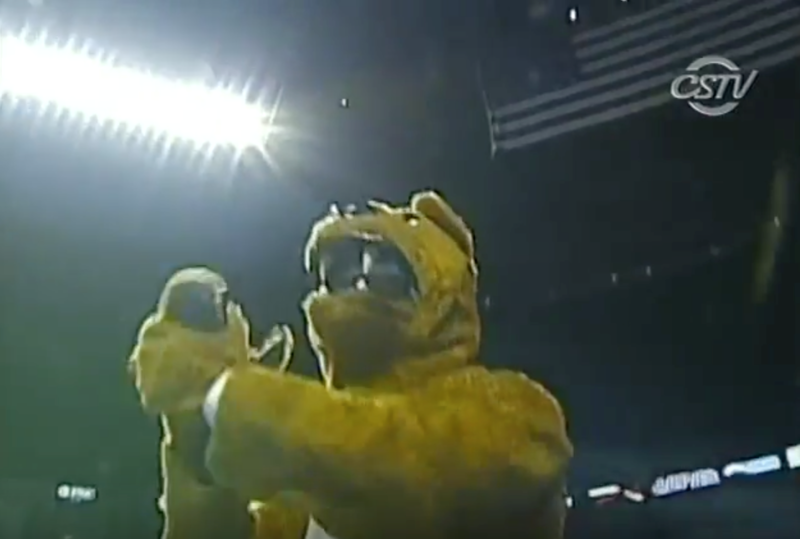 Update: The Penn State mascot is still a thing of nightmares in 2005. 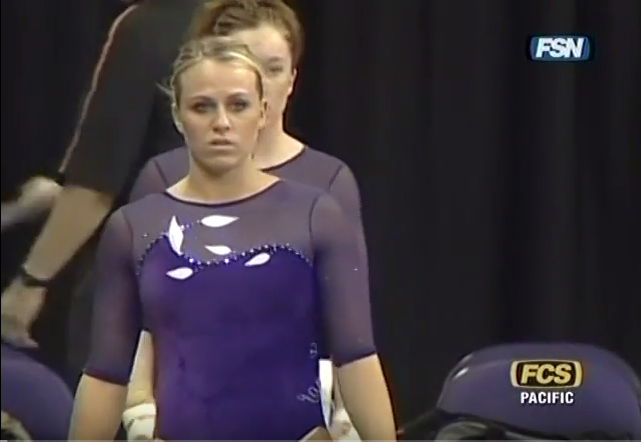 Raise your hand if you hated leos with the clasp thing in the back. Us, too. 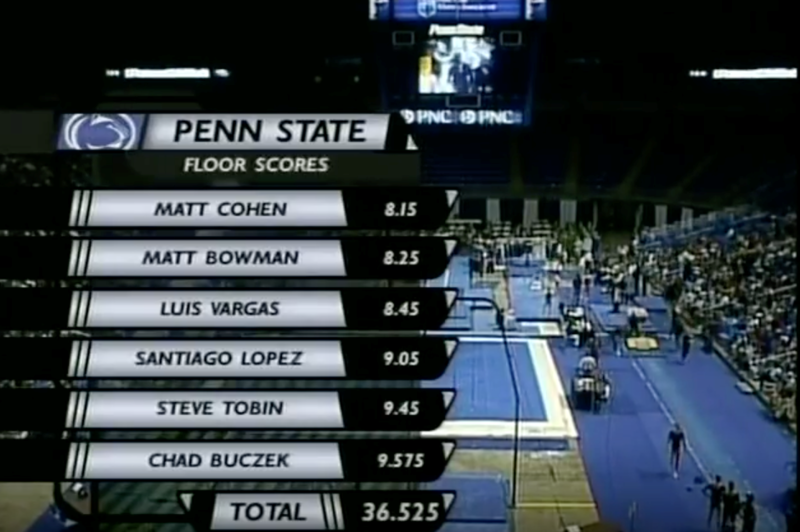 So, the Penn State men have essentially the same leo as in 1984 except for slightly longer shorts. 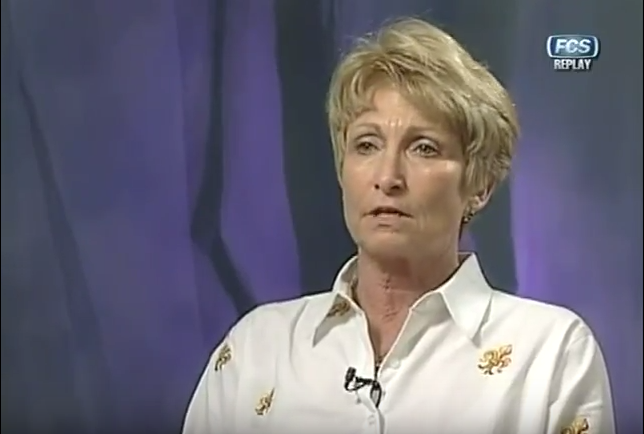 Apparently the “Hitler Youth” hairstyle was a thing back in 2005 as well. And here we were thinking the 2016 Olympic team was just going through a 1940s-phase. 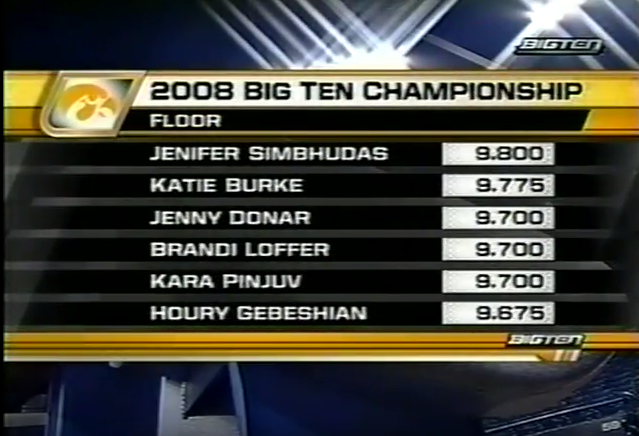 We can’t fault the ‘00s for its vault variety. So much velvet yet still some sparkle??? GW, we’re in love! Peep the bottom left when the mom smacks her daughter’s hand away from her face. His shorts are so long; he’s basically wearing pants compared to prior years! We almost managed to forget about T-shirt over long sleeve style. Almost. Mini jean skirt with a camisole? 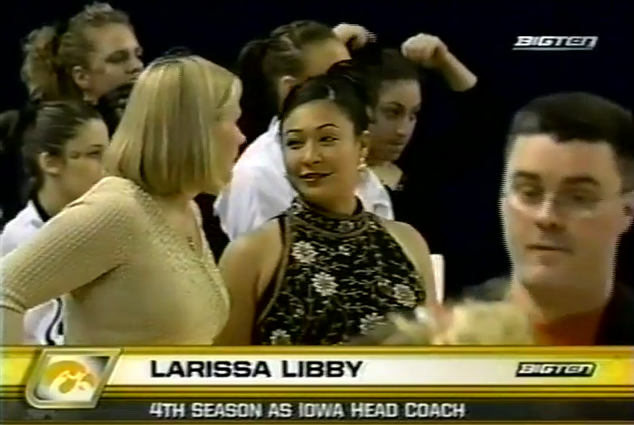 Hi, mid-2000s. Ah, the random leaves leo, we know it well. 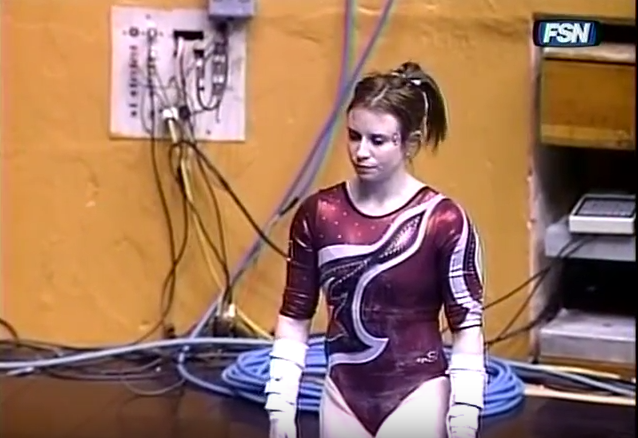 SPU going full monocrhome, including the all velvet everything warmup. More of this mount please. 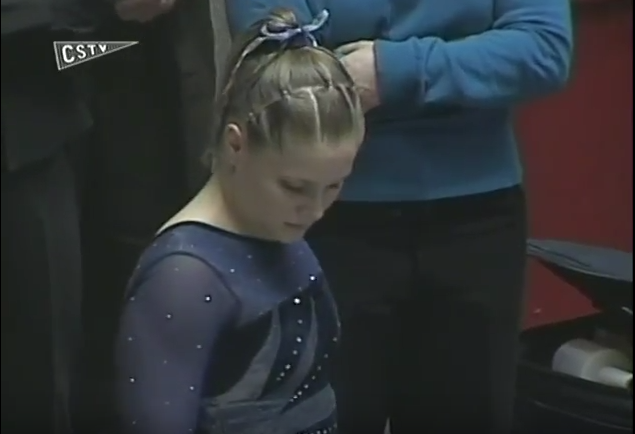 Ah, the days when you could just put your hair in a simple ponytail for a meet. 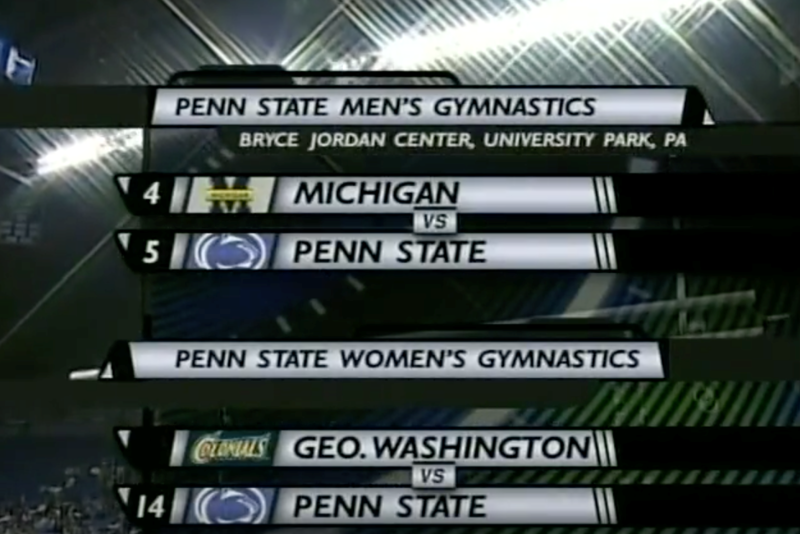 You better believe this meet starts with a montage set to Coldplay. 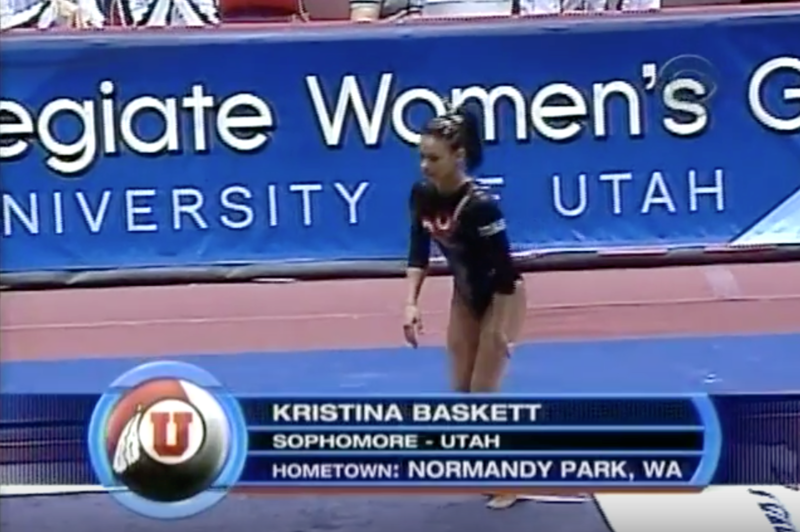 Kristina Baskett adding the half twist before it was trendy. 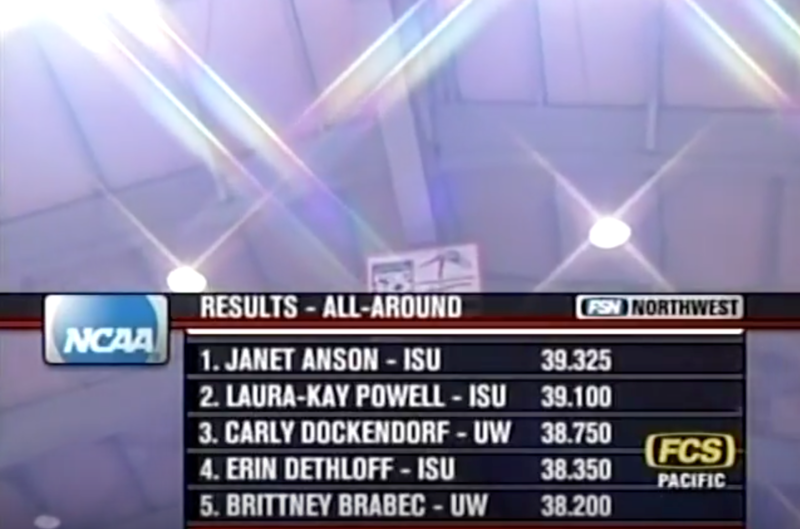 Handspring double! But also, ouch. An off day, you might say. 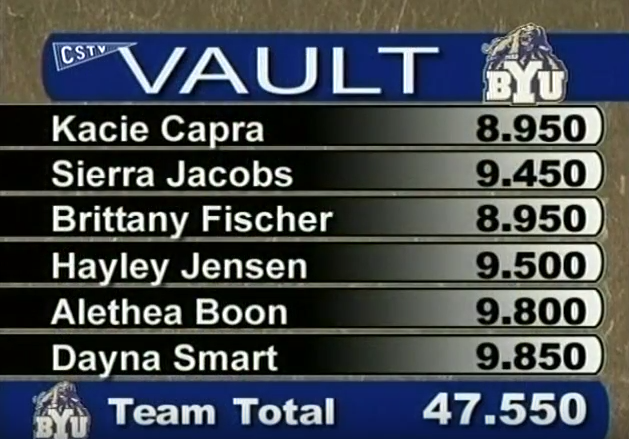 This just in, BYU floor has always been amazing. Back in Black going on here and Missy hates it. We’re just gif recapping at this point because! Miss you Ashley. PS her beam music is Sean Paul’s Temperature. Yup. 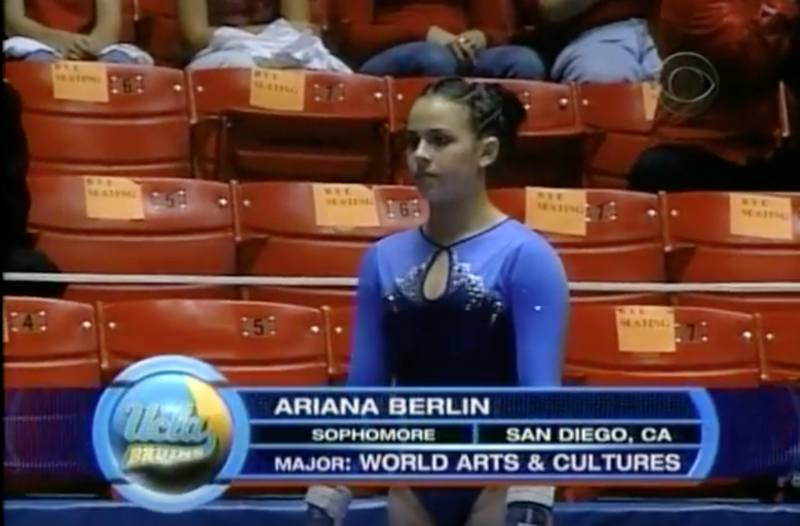 Reminder that she did a double Arabian, 2.5 punch front and triple. Yep that’s two E passes. Oh the teal glitter eyeshadow. It’s fantastic. It’s also nowhere close to Arkansas or Kentucky colors. Even better! 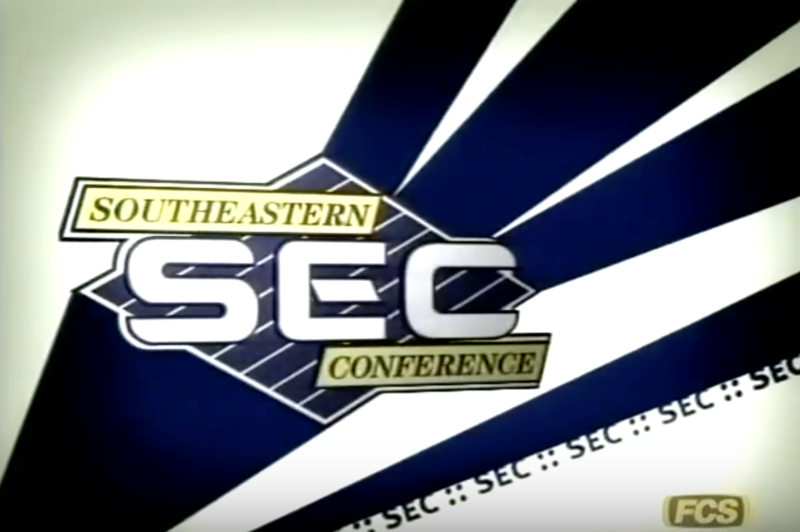 The SEC Network before the SEC Network. RENE? IS THAT YOU? We hardly recognize ye. 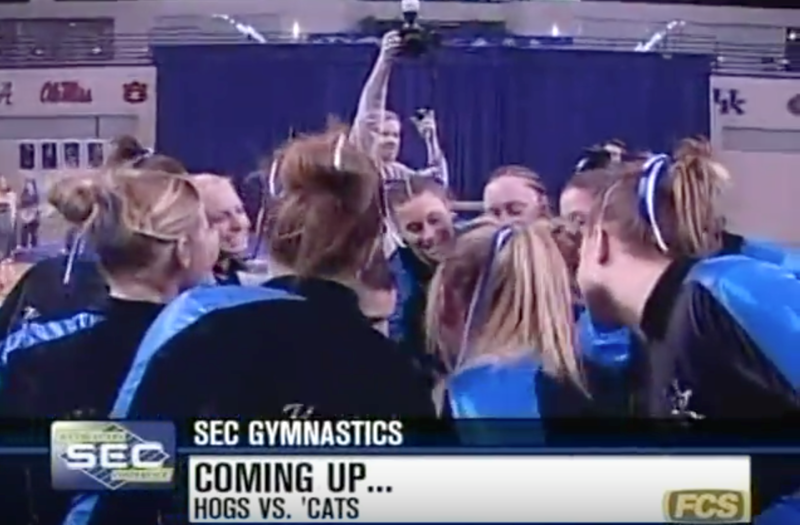 “HOGS vs. ‘CATS” Who else is glad we (mostly) grew out of those nicknames. 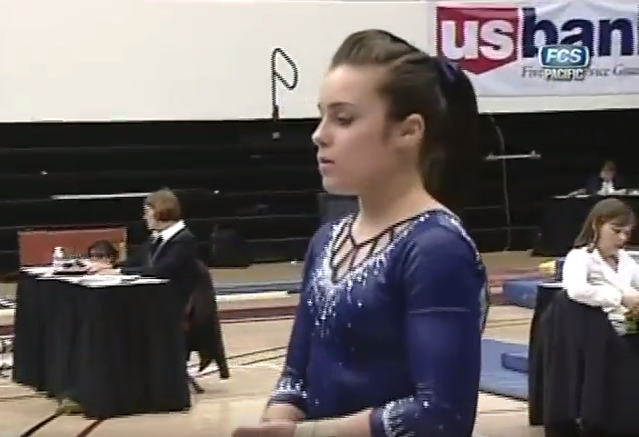 This leo is fairly modern for 2007 if we’re being completely honest. 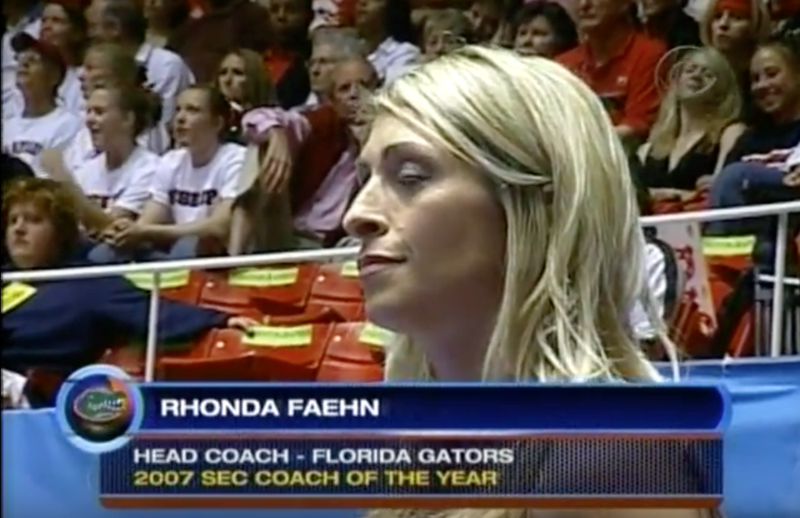 FYI we miss this leo a lot, Florida. 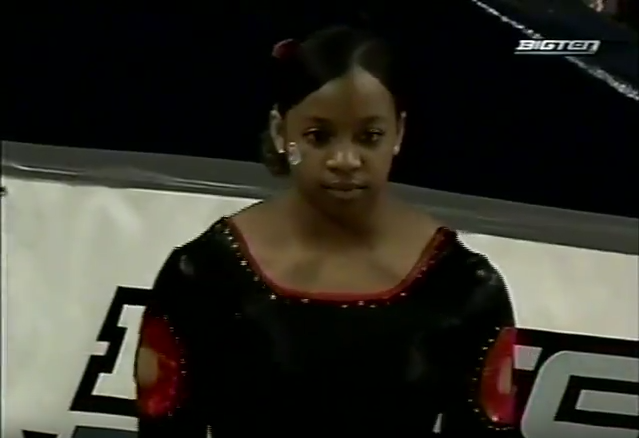 Aluminum foil warmups. We don’t hate it. Driving car or showing off rings? 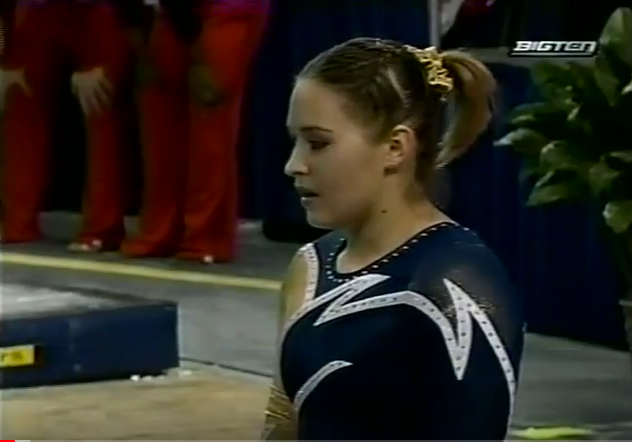 When UCLA was still wearing this leo 10 years later. We’ll say it again. 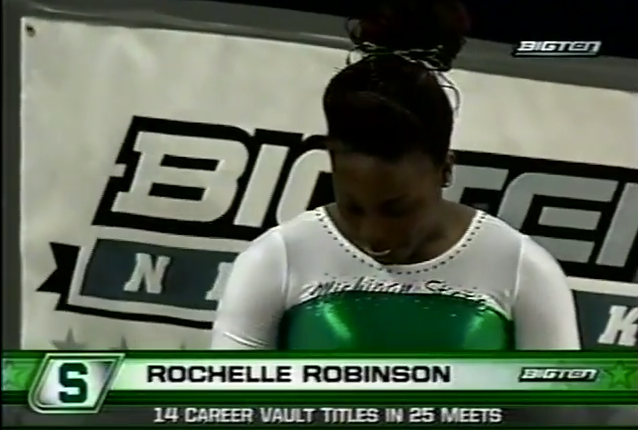 Rhonda doesn’t age. 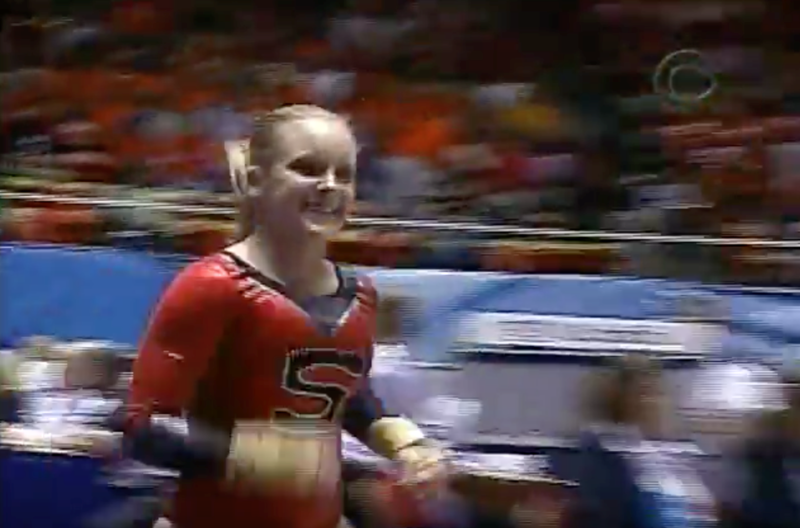 Stanford continues to think this leo design is hip. Rather tame for a Nebraska leo if you ask us. Wear this color more, UCLA! Do we sound like broken records yet? Who all is keeping count? 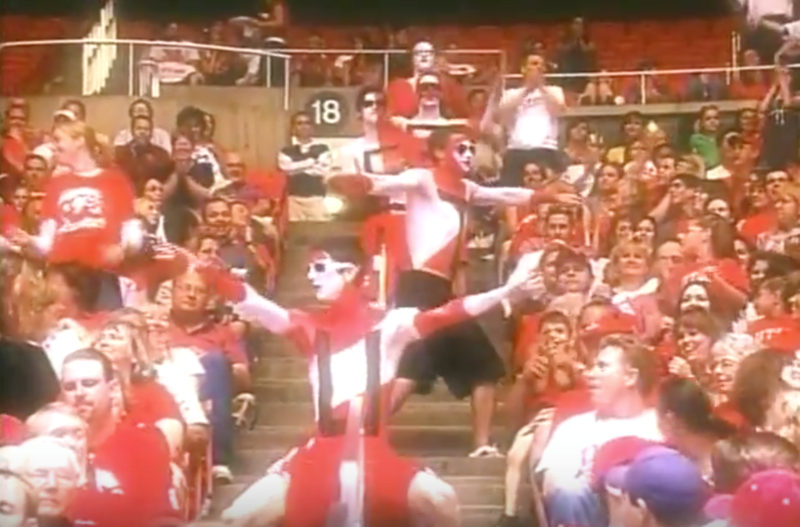 Crazy Utah fans is not a new concept. 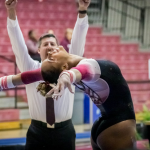 She’s not a gymnast, but she is coaching now! 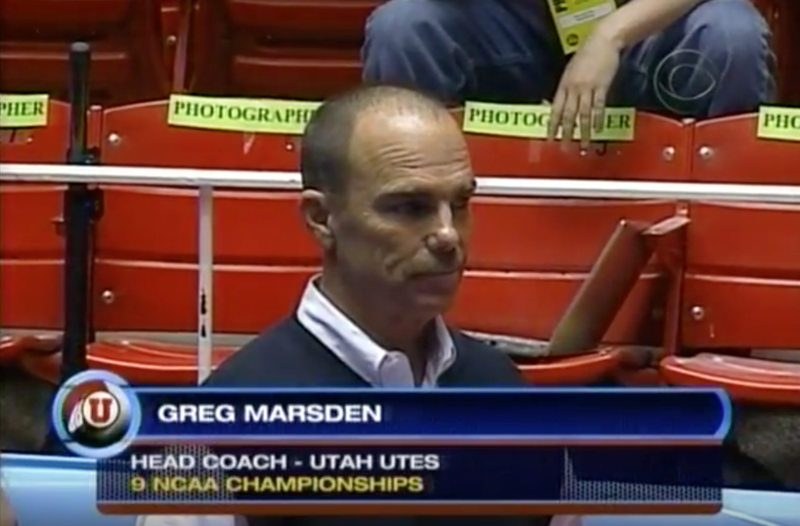 Nice sweater vest, Greg. Also, we miss the mustache. Hello, Emily! 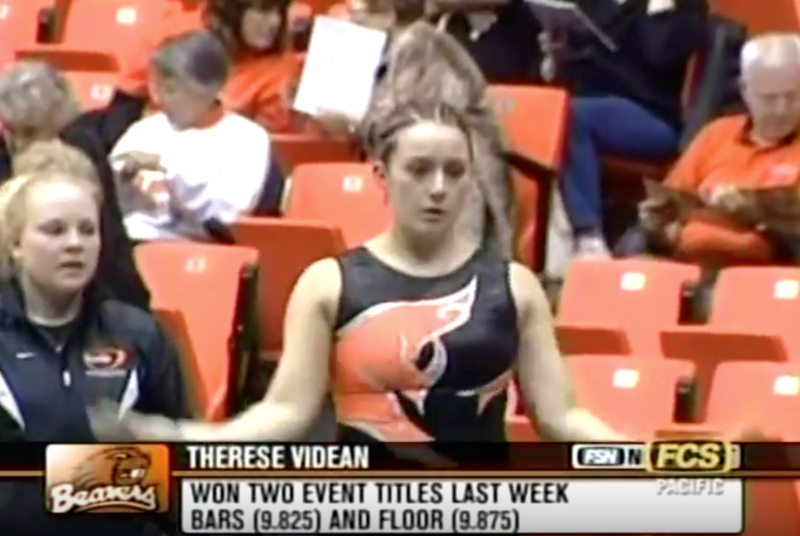 Gymdog turned CrossFit sensation. 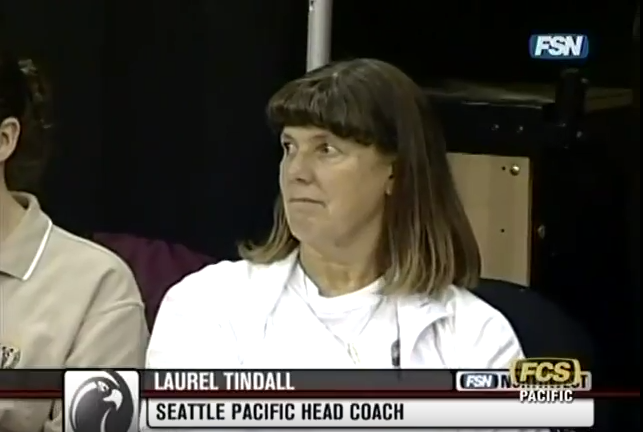 Add another now-coach to the list. Psst, Anna. There’s a coaching position open at SJSU. Just a thought. K bye. Fluffy, furry hair scrunchie FTW. Finish meet? 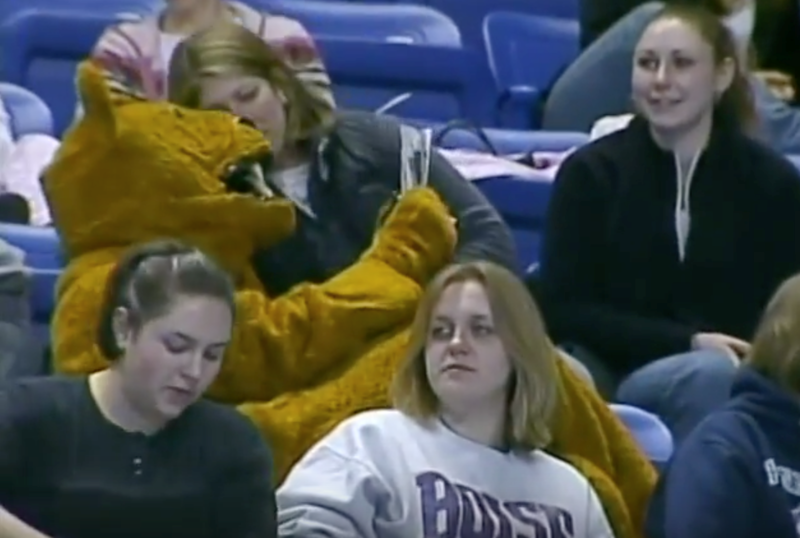 Hang out in stands. Sacramone still Sacramone-d, even at Brown. 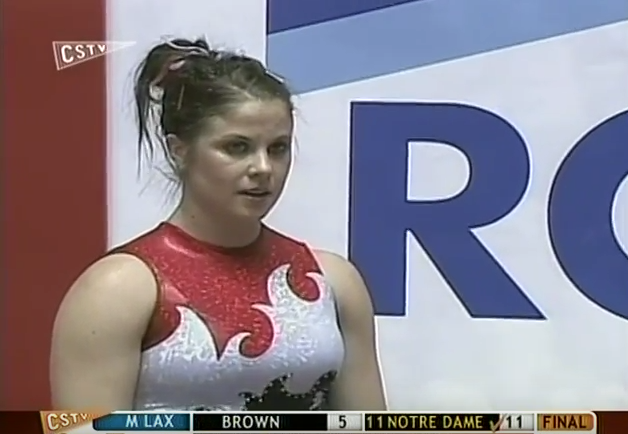 Also, who else from Brown has ever gone to NCAA nationals? 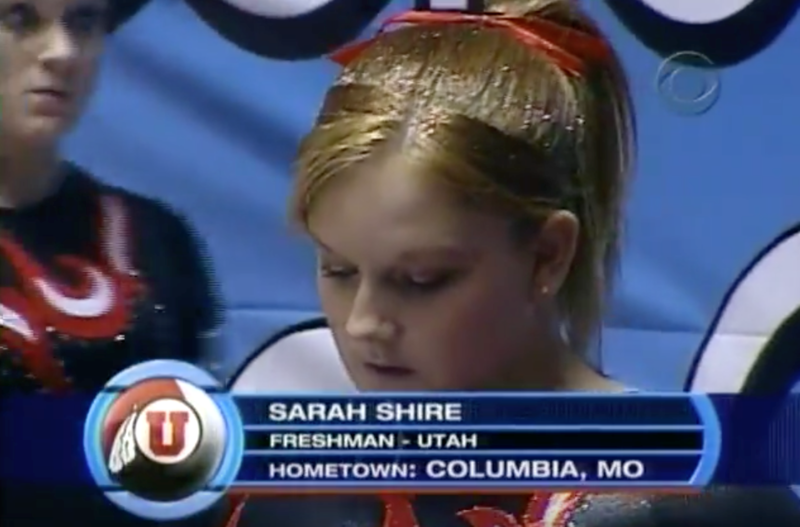 Man, she really let loose in college, huh? 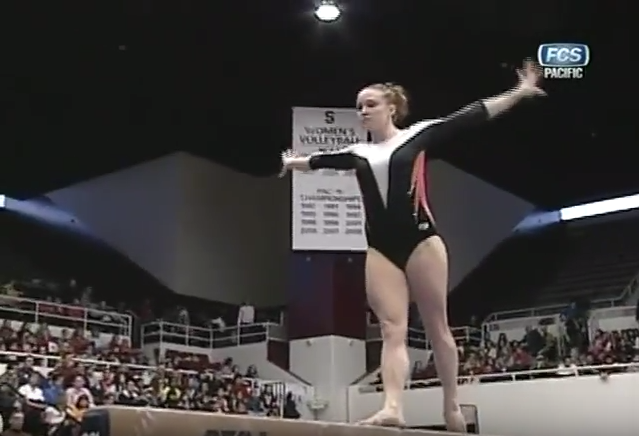 Throwback to when ASac basically did her elite beam routine in college but then dismounted with a tuck full. OK enough of these into the lights headshots. 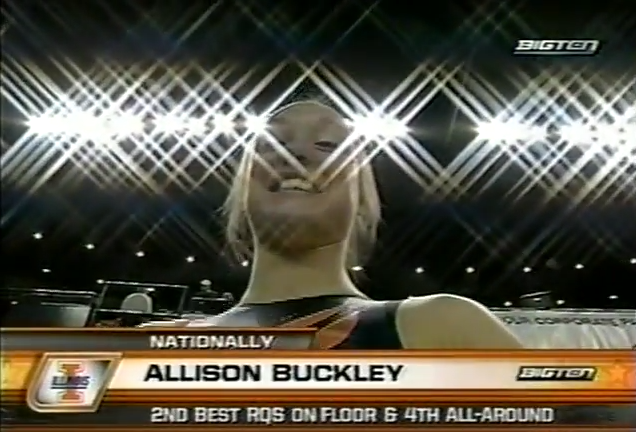 Fun fact: Our Big Ten editor competed (always unsuccessfully) against Buckley during high school! 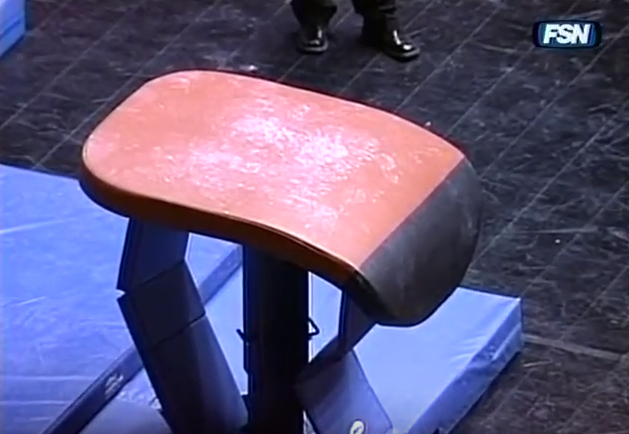 THIS WARMUP. Is that…leopard print?! Minnesota why. THOSE “O” CUTOUTS. We’re screaming. And a stuck Y1.5?! OK tOSU. A very different Michigan look. More front gainer fulls, please. Every Illinois leo from 2008-2017 was the same. WE SAID IT. We’re not mad at this one. 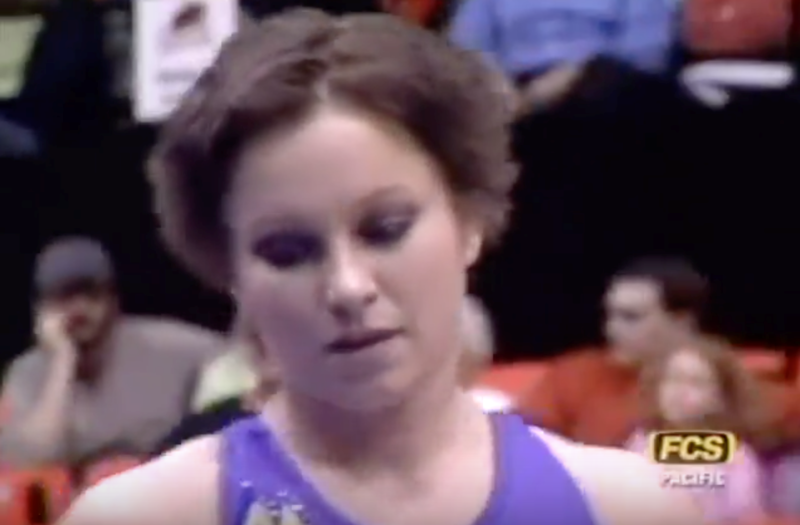 If you’ve never watched a full Kylee Botterman floor routine, now would be the time. 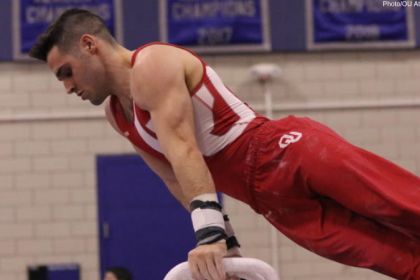 Press + planche = heart eye emoji. MARY LEE WHAT IS THIS. Oh, SEC. 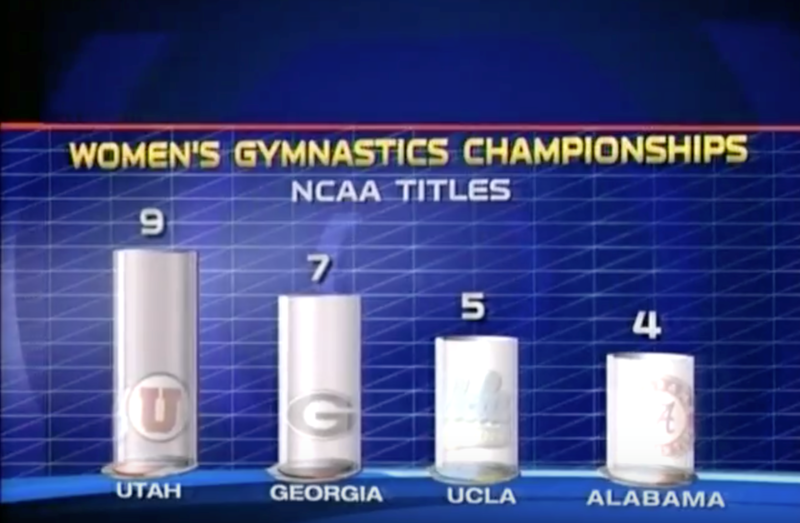 But, kidding, Missouri was still in the Big 12 in 2008! Hi, Rob! 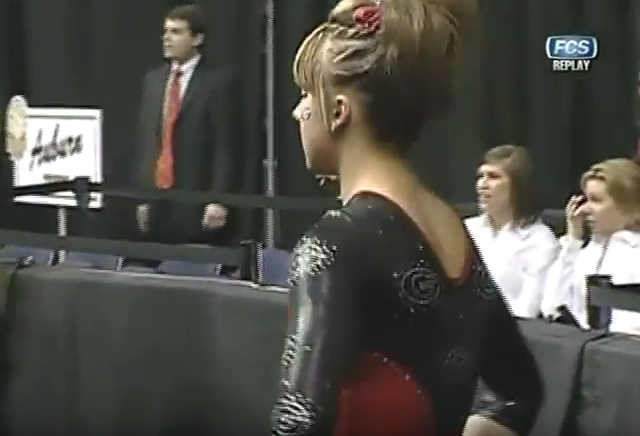 Also, this leo! The back! 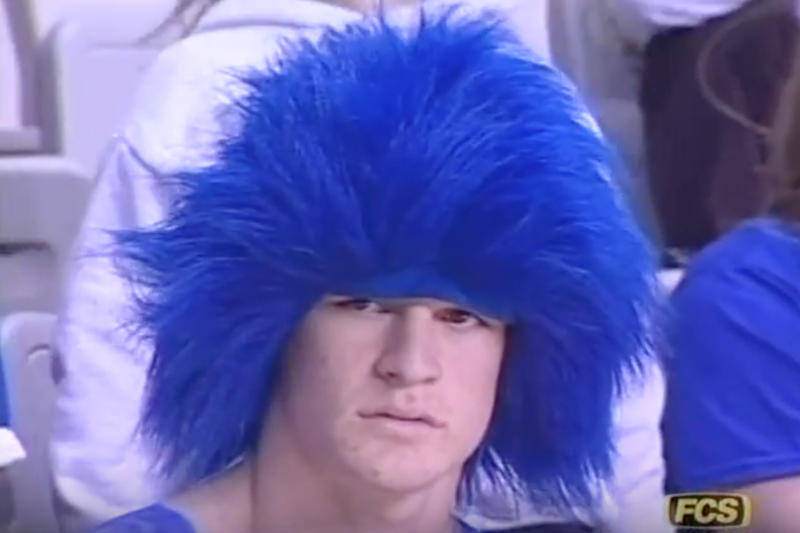 Resurrect this one, Mizzou. This is a KJ OU leo. 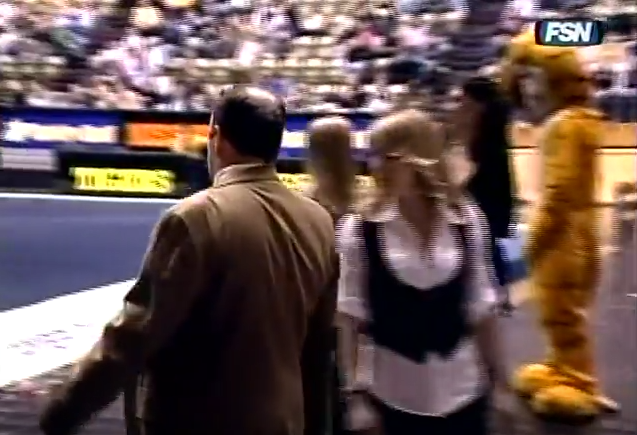 We can really stop bringing mascots to gym meets. 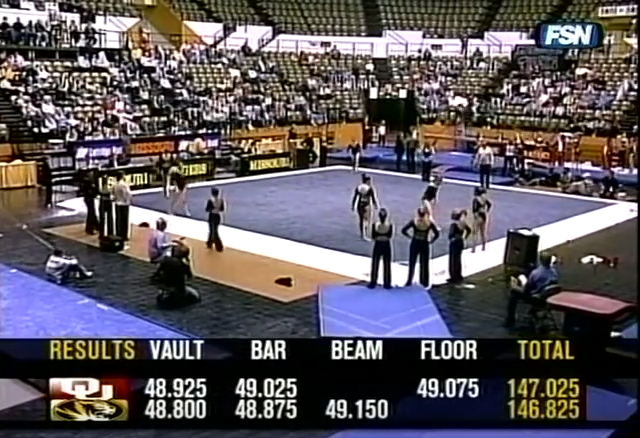 Sarah demonstrating the “I just stuck my vault” run. 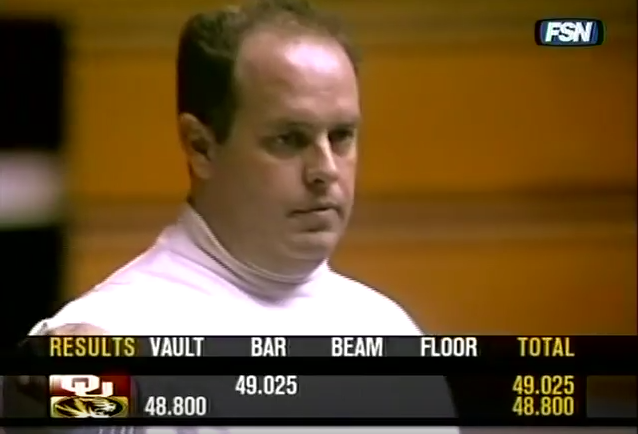 It’s 2008 and we’re still talking about the “new” vault. So creative. More Markelovs, please. So retro. Someone on the graphics team missed a wee typo there. OK but when are we going to see a giant tree instead of the “S,” Stanford? WHEN?! 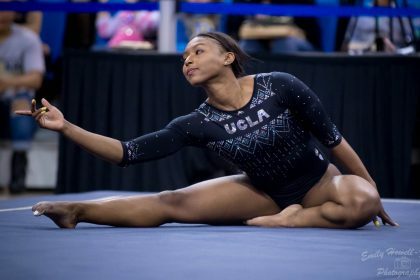 UCLA, we love you, but we’re ready to see some new leos. Also, peep the script “Cal” sleeves in the background. The one and only Elyse Hopfner-Hibbs. 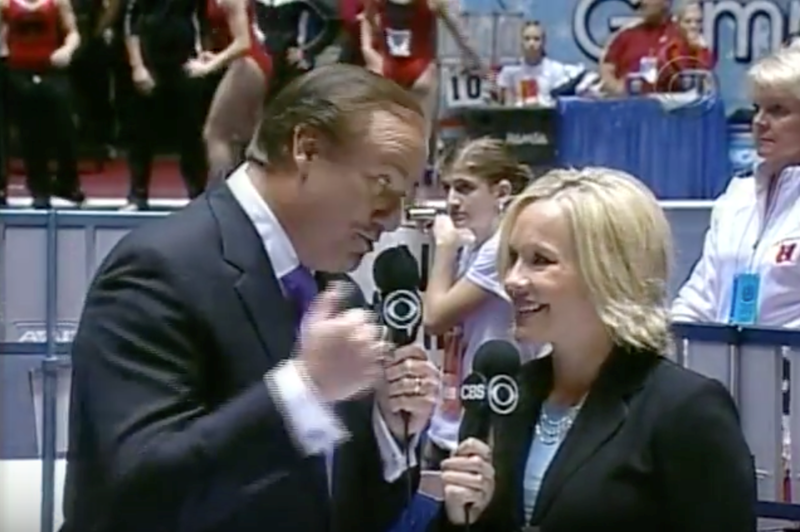 We got a single ASU routine and zero Washington in this broadcast. OK OK OK.
SECs in Nashville for some reason? 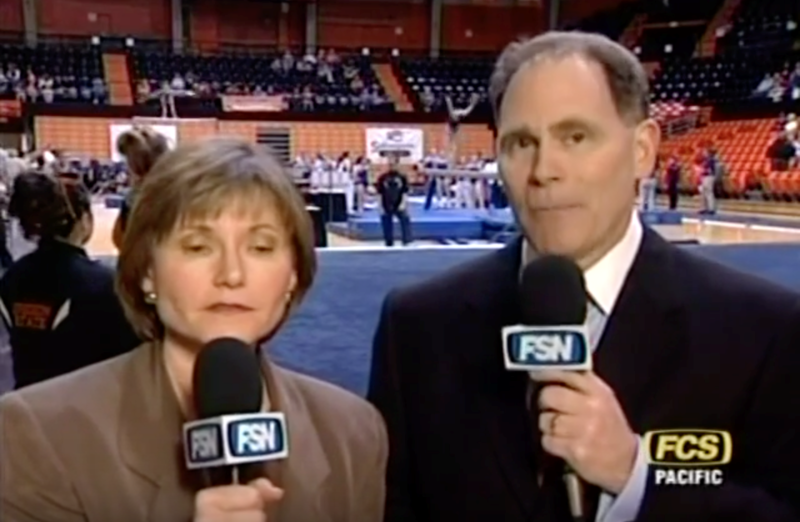 This is Suzanne’s farewell (for now) SECs, so we’re anxious for the fluff. 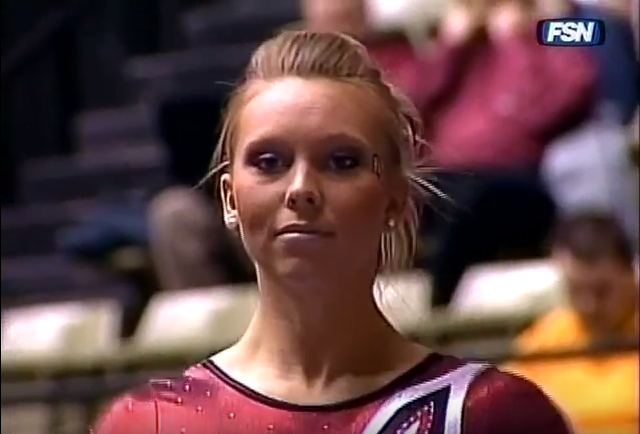 If we’ve learned one thing doing these throwbacks, it’s that Sarah’s jewelry was always A+. 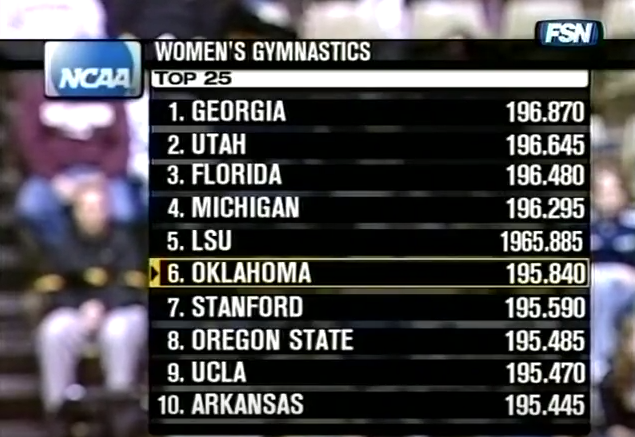 This is how Georgia started the day, so this will be a very SEC meet. 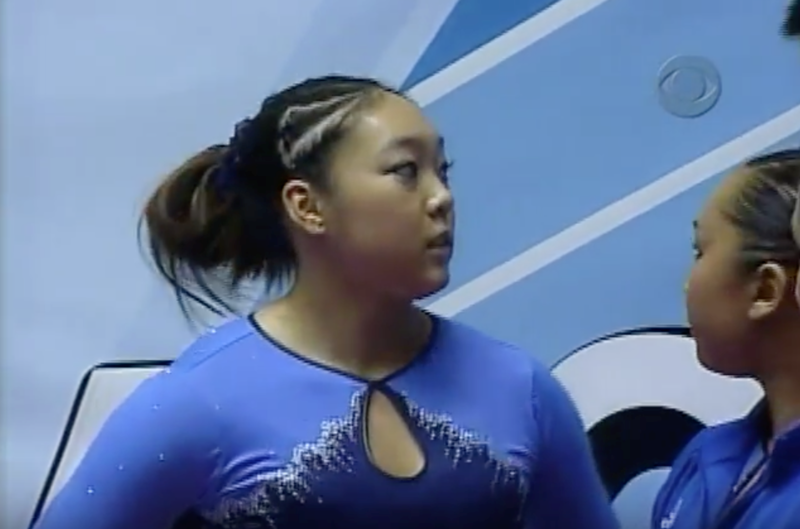 This leo is covered in Gs. Just, covered. Does LSU still wear this? There we go. Back on track. 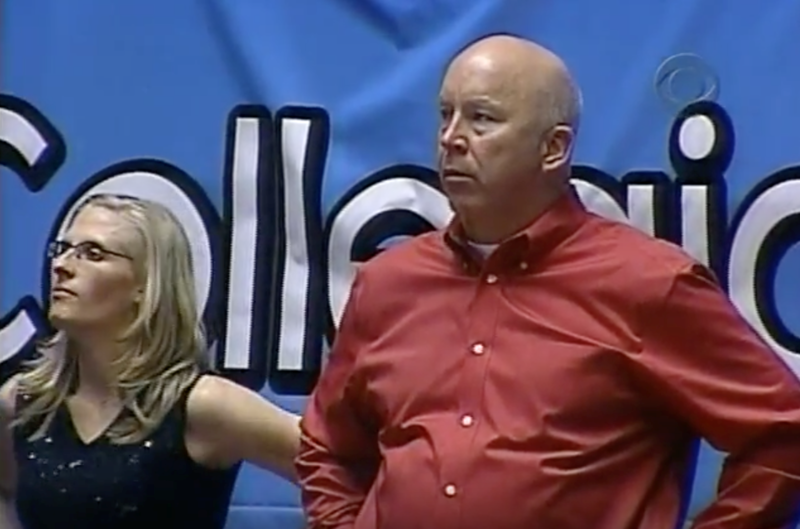 Thanks, coach. Can we pretend that airplanes in the night sky are like shooting stars? That’s a 2010 song but close enough. 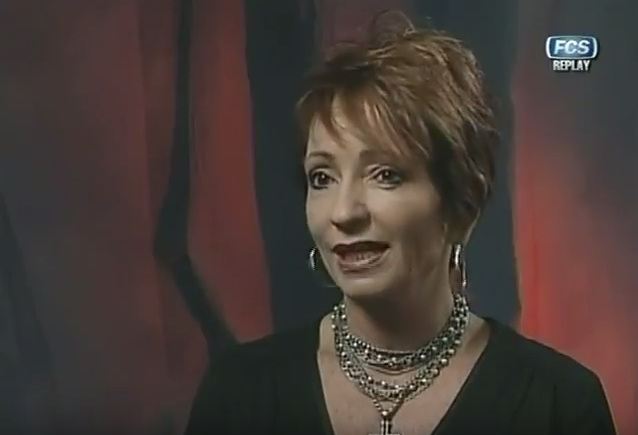 A fleur de lis shirt, of course. 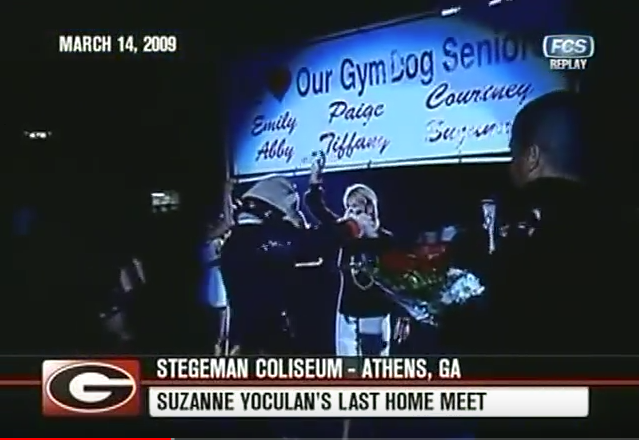 Note that Suzanne is listed as a senior on that banner there. Gotta have some CK Achilles fluff, too. It’s OK, you’ll come back with a vengeance. 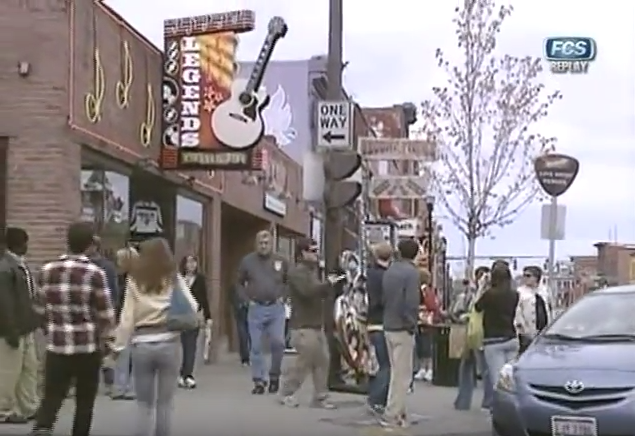 “All you can eat zone.” Nashvegas, baby.